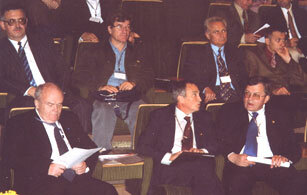 ILIT RAS is a co-organizer of a number of international conferences on laser physics and technology, optics, photonics, such as "Laser Optics", "Coherent and Nonlinear Optics", "Laser Technologies", "Advanced Laser Technologies", "Lasers in Life Sciences", IQEC/LAT 2002, ICONO/LAT 2005. ILIT RAS regularly organizes and holds traditional conference "Industrial Lasers and Laser Applications" that has become international. 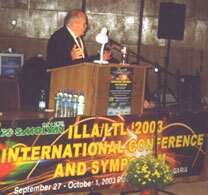 Eight "ILLA" conferences were held from 1982 to 2004. The scientists of the Institute take active participation in significant international forums on photonics, lasers, quantum electronics ("Photonics West", "Gas Flow & Chemical Lasers", "LASE", etc.) and in workshops for young scientists. ILIT RAS has held three All-Russia workshops "Laser and Computer Technologies of Complex Parts Fabrication". 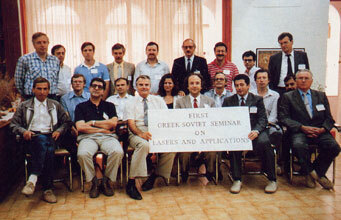 ILIT RAS has initiated and organized international workshops "Greek-Russian Seminar on Lasers and Applications", "Adaptive Optics for Industry and Medicine". The Institute actively collaborates with the largest companies, research centers and universities of Russia, CIS countries, and foreign states (Great Britain, USA, Germany, Japan, India, China, Bulgaria, Slovakia, Czechia, and Poland). The most known centers and companies cooperating with ILIT RAS are AMP Corp., Rochester University, Army Research Lab, Phillips Lab (Albuquerque), Wake Forest University (USA), Max Planck Institute, Saarbruecken University, Dresden University of Technology (Germany), Nottingham University, Imperial College (London), DERA (Great Britain). The employees of ILIT RAS are engaged in fundamental and applied researches in the framework of international grants and contracts.